Sound art doesn't get much attention in major museums—which is surprising, given how often modern art deals with intangible subjects. But this weekend, MoMA opened up its first exhibition devoted solely to audio art, Soundings, and it was definitely worth the wait. Soundings is surprisingly simple, as exhibitions go. It's ensconced in a lesser wing of the Museum, and there are only 16 artists involved—most of them contemporary. In one darkened room, you can hear the magnified noises of a forest at night, including the echolocating bats. In the courtyard, bells from different sites around the city toll every minute. There's sound recording from within Chernobyl's abandoned swimming pools. Not all of the art is purely noise: there are films, paintings, and installations, too. As with all art, it's probably better to just go check it out. But if you're not in town, we've included the highlights in a video below, along with photos from three of the strongest pieces. In 1943, the Nazis staged a huge propaganda campaign to "disprove" rumors about concentration camps. Czech composer Pavel Haas, who was imprisoned at Theresienstadt, was enlisted to compose and perform one of his pieces, Study for Strings, for a propaganda film called The Führer Gives the Jews a City. The next day, he and the performers were murdered. 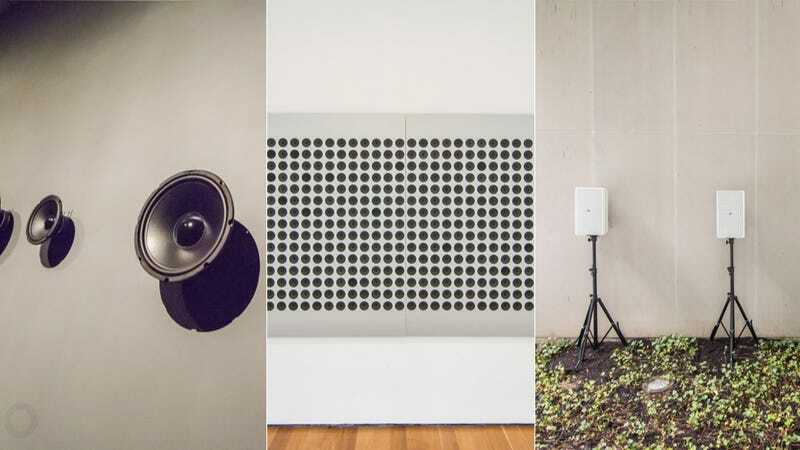 In MoMA's galleries, eight speakers in a dark room play pieces of the recording—which is haunting and almost unrecognizable thanks to Susan Philipsz's deconstruction of the original piece. Listen to it here. Tristan Perich's long installation is made up of 1,500 tiny speakers that each play a different pitch. From far away, they coalesce into white noise. But up close, as you can see in this video, you can hear each individual tone. A Bell For Every Minute, 2010. In MoMA's courtyard, an installation by New York artist Stephen Vitiello plays a tolling bell every minute, each from a different site around Manhattan. There are huge gongs and tiny chimes, culled from places as diverse as the bell from a fireboat to a chime from a yoga studio. At the top of the hour, they all go off at once. Listen to it here.